By Mike Smith: Deontay Wilder shutdown rumors of him facing former heavyweight champion Wladimir Klitschko later this year by saying that he’s not thinking of a fight against the former champ. Wilder feels that Klitschko needs to start fighting again before he would consider giving him a fight. Wilder points out that Klitschko (64-5, 53 KOs) had been out of the ring for two years before losing his last fight to Anthony Joshua by an 11th round knockout on April 29, 2017. Klitschko has now been out of the ring for another two years since the loss to Joshua, and he’s currently retired from boxing. 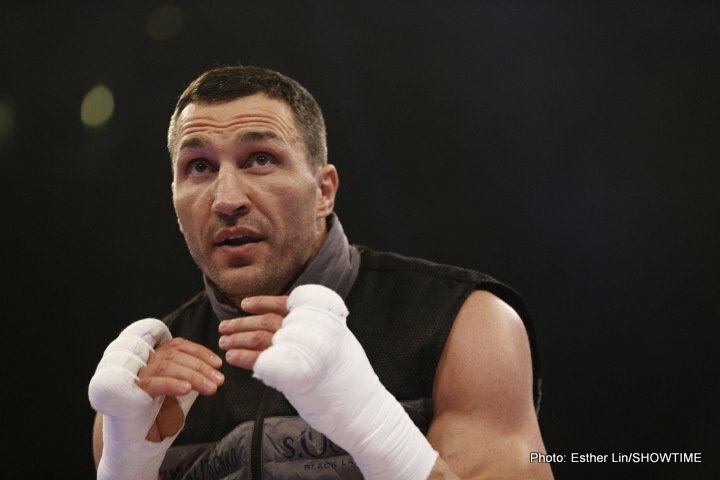 Wladimir will be turning 42-years-old next week on March 25. There’s been a lot of speculation that Wladimir is thinking of returning to the ring soon. Five years ago, Wladimir used Wilder as one of his sparring partners to get him ready for a title defense against Kubrat Pulev. Did Wladimir learn enough from those sparring sessions with Wilder to feel confident of beating him? If Wladimir could come back from a 2-year layoff to dethrone Wilder as the WBC heavyweight champion, it would setup a big money rematch between Wladimir and IBF/WBA/WBO heavyweight champion Anthony Joshua. “Nah, we’ll still have to see what he [Wladimir] does; let him get back in and build him up,” Wilder said in giving his thoughts about the rumor of him fighting Klitschko via the Metro.co.uk “Look, Klitschko, when he fought [Anthony] Joshua, he was out for two years and he came back and lost the stuff, so he got to build himself back up. He can only live off his name for so long. You get to the point where [you’re not] that fighter that you used to be,” Wilder said. Wladimir sitting out of the ring for 2 years, and then getting a title shot doesn’t sit right with Wilder. That is what Klitschko did in his fight with Joshua two years. Wladimir didn’t fight for 2 years, and then returned to the ring against Joshua. Wilder noticed that Klitschko didn’t call him out when he returned to the ring two years ago. He only wanted the Joshua fight. “When you come back, you gotta build yourself back up,” Wilder said about Wladimir. “Especially against someone like me, because I’m coming in for the kill. I ain’t playing around with nobody. And I don’t think he’ll want that fight, to be honest in my opinion. Klitschko had many times to challenge me. Every time he coming back, ain’t nobody mentioning Deontay Wilder’s name because they know that this is a tough fight,” Wilder said. It’s likely that if Wladimir did return to the ring, he would do it against British heavyweights Tyson Fury or Joshua, as he lost to them in his last two fights. It wouldn’t make sense for Wladimir to come back and fight Wilder instead of facing one of them to try and avenge the losses.